On a bright, March morning snow had begun to thaw from the edge of a local loch after a big freeze. The ice had melted and, with a few tentative green shoots of new sedges coming through, there was a sense of approaching spring. I was attracted by the abstract shape of the snow-edge and the deep, petrol-blue water contrasting with the white snow. 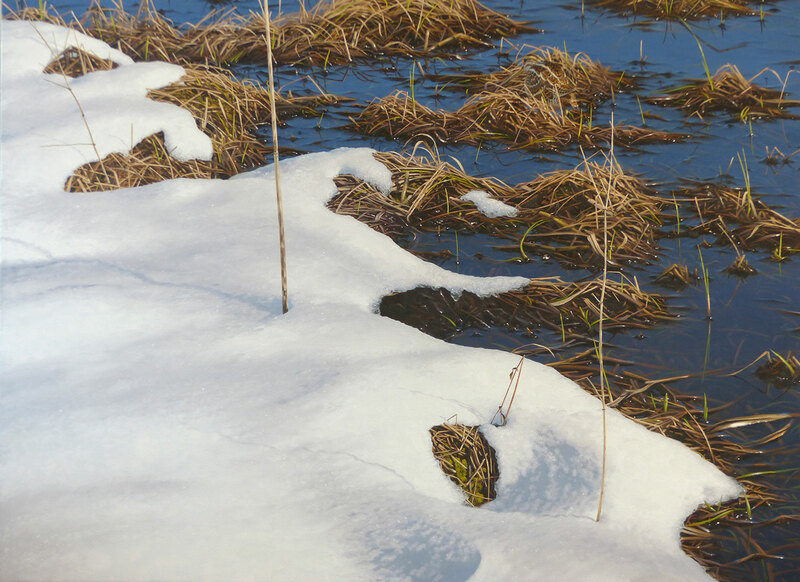 The sedges formed rhythmic patterns and offered a colour contrast with the blue water, and vertical stems of dead umbellifer and sorrel offered a delicate counterpoint to the bold curves of the snow. As I approached the water’s edge a snipe flew up – its superb camouflage rendered it invisible to me until it broke cover. I have often watched snipe from the cover of a hide and marvelled at their camouflage; their presence, even at close quarters, is revealed only when they move. 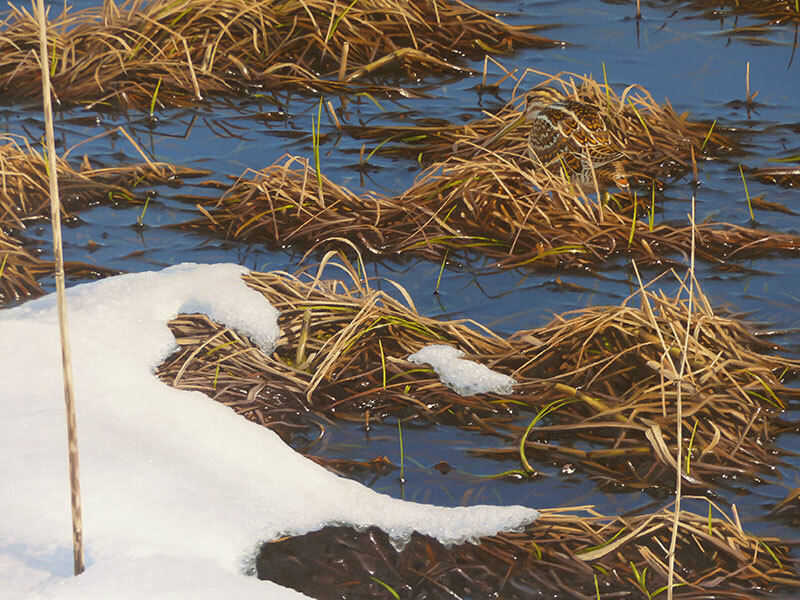 Although this painting is as much about colour and pattern in this tiny pocket of the landscape as it is about wildlife, I wanted to convey that ability of snipe to hide in plain sight. 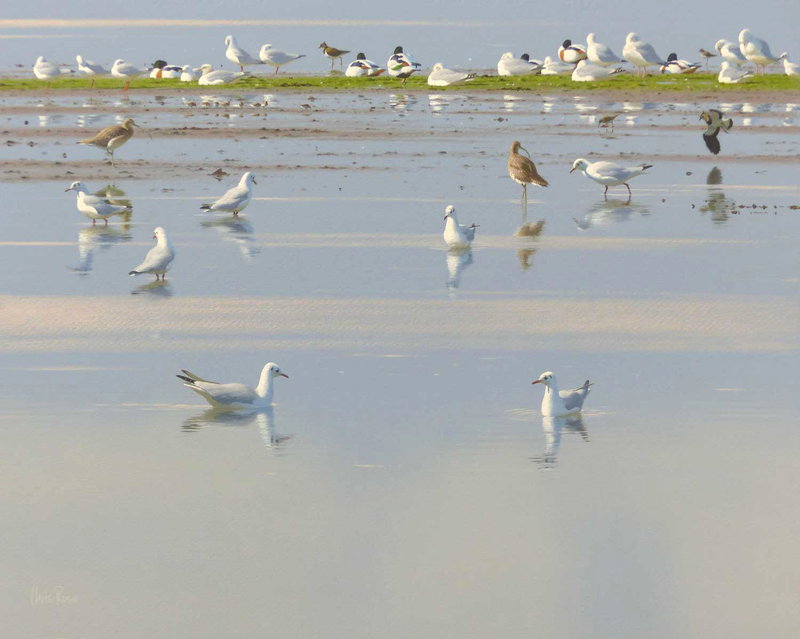 The bird is not hidden, it is just brilliantly camouflaged.